Made by Shepherd, G F, 1960. George Shepherd was a wealthy Melbourne oil company executive who regularly played cards with friends, seated in big upholstered chairs. But the tiny castor wheels fitted to the chairs made them difficult to move. A booklet written by the castor's inventor George Shepherd, it describes the development, manufacture and marketing of the castor. The cover is buff coloured. 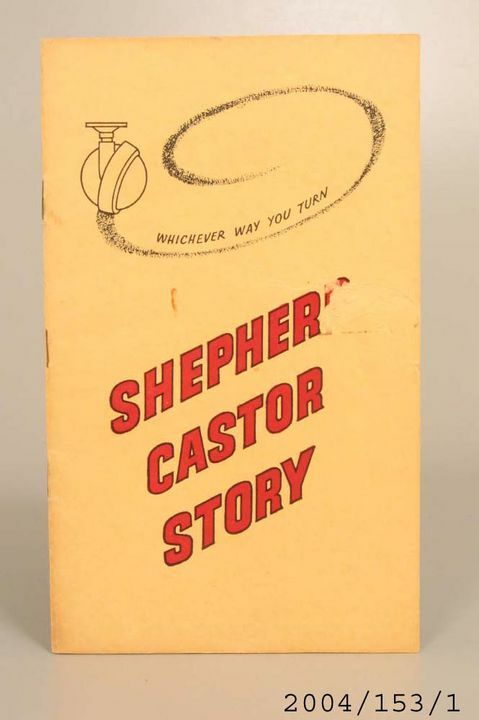 On the front cover is a sketch of the Shepherd castor and the text 'Whichever way you turn' above the title 'Shepherd Castor Story' in red block letters. The inside covers bear cutaway diagrams of the castor. The booklet has 24 pages and the text is illustrated with black-and-white photographs. It has a staple spine. This booklet was written by the inventor of the Shepherd Castor G. F. Shepherd (who died in 1971 aged 83). It was printed by Brown, Prior, Anderson Pty Ltd, Melbourne, 1960. The donor was formerly an accountant with Lane Hardware, the company that manufactured Shepherd Castors in Australia.